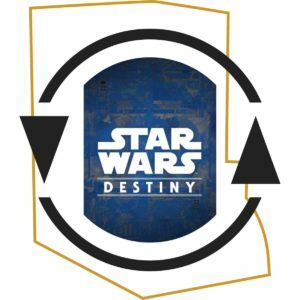 Posted in Star Wars: DestinyTagged Decklist, ReviewLeave a Comment on Is Palpatine Playable After Rotation? 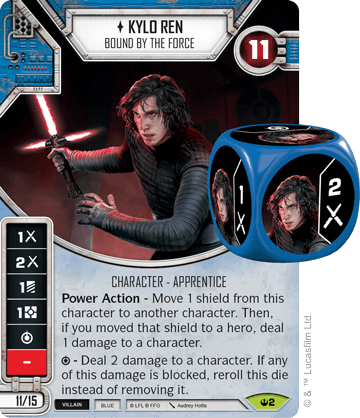 Is Kylo Anakin A Viable Deck List After Rotation? Kylo and Anakin (well, technically Vader and Anakin in the Clone Wars show) are two of my favorite characters in all of Star Wars. Naturally, when they can both be elite on the same team it is bound to be one of my favorite decks. This has been one of my go to decks for the Trilogy format since the release of Legacies. Below is the current version of my deck! 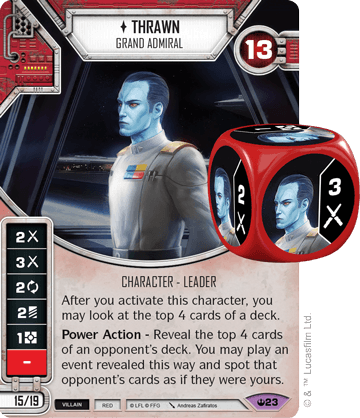 Deck Overview: The deck plays remarkably close to what you would expect these characters to play like. When you play this deck, you put all your weight behind every swing! Unlike decks that try to make plays to create advantages your opponent cannot come back from (aka blow outs), this one is all about consistency. 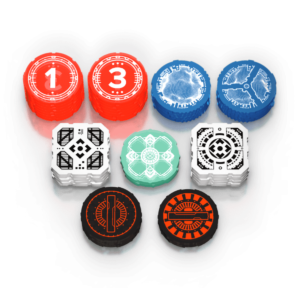 Turn after turn, it deals a steady helping of damage while slowly building it’s dice pool through upgrades. This is a great deck for newer players or anyone not looking to strain themselves figuring out how to play a deck at their next event. Opening Hand: Witch Magick allows you to reveal the top three cards of your deck and heal one damage from a character for each odd card. There are only eight even-costed cards in the deck, including Crossguard Lightsaber, Treasured Lightsaber, Doubt, and Hidden Motive. As it happens, these are the four cards I am looking for in my opening hand! Crossguard goes on Kylo for a free damage and Treasured Lightsaber goes on Anakin for a free card. Doubt and Hidden Motive are free, which means you can play an upgrade and still have control options on turn one. This also lets you thin your deck of even cards, making Witch Magick more consistent in the mid to late game. Finishing Moves: Both Kylo and Anakin have similar die sides, making either of them dependable characters to finish a game. Kylo’s ability is very powerful, so you naturally want to upgrade Anakin first to tempt your opponent into attacking him instead of Kylo. It it likely that one of your characters will be defeated, even in the games you win. This makes upgrades with redeploy critical in the mid to late stage of a game. 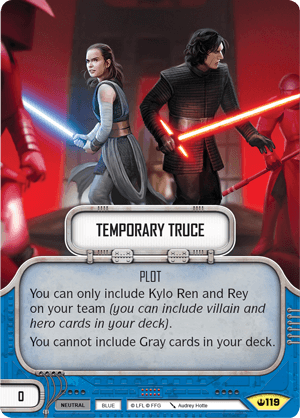 Posted in Star Wars: DestinyTagged Decklist, ReviewLeave a Comment on Is Kylo Anakin A Viable Deck List After Rotation? I considered pairing the newest version of Chewbacca, The Beast, with the most recent version of Leia Organa. This would let me play a deck I could call Beauty and the Beast and it would let me play the 2-point plot Profiteering that we are revealing on this weeks episode of The Covenant Cast. From the moment I saw The Beast though, I knew I’d be pairing him with an elite version of Han Solo. It only took me one game playing Han Solo, Independent Hotshot, in my Shades deck to understand just how good he is. He doesn’t seem wildly impressive at first, but you would be hard pressed to find another character as consistent at dealing damage and gaining resources. You can see my current Han / Chewie deck below, which I will be playing (while revealing the other previews) on the stream (YouTube, Facebook, and Twitch) Monday, February 11th at 4pm CST. This deck is pure, unadulterated theme… and it actually has a shot at working! The deck is great at generating resources and Guardian on a 13-health Chewbacca will make it tough for your opponent to defeat either characters early. The extra time will let you get one of a few key elements established as you head into the end game to pull off a few very powerful smuggler tricks! The Opening: Early in a game, this deck is all about resources. If possible, pick your battlefield and re-roll with Han until you can resolve for resources. You are looking for Escape Craft and Well Connected in your opening hand. You either need to stack up resources or get a few dice in play early, so you can continue stacking up resources. 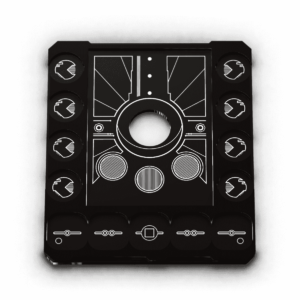 Your are aiming to ramp fast enough to get a few powerful upgrades in play or the Millenium Falcon! Finishing Moves: The deck includes a handful of sneaky smuggler tricks that can put games away! 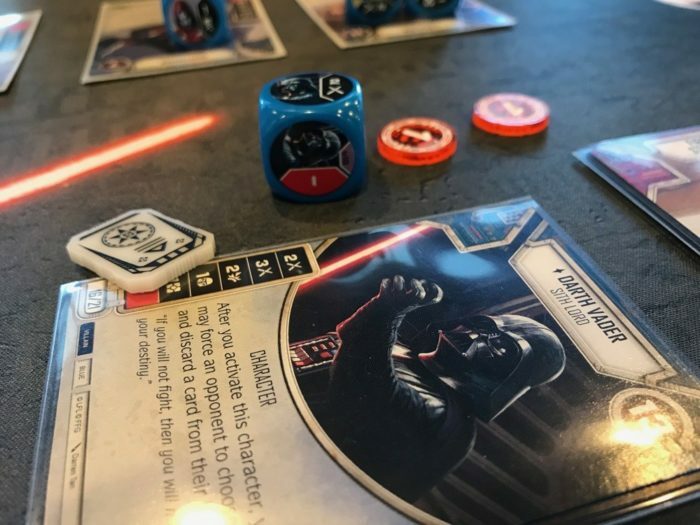 Quickdraw (assuming you have a Hidden Blaster) and Drop In allow you to activate a character and immediately resolve their dice (how thematic, right?). This is particularly powerful whenever one of your characters is about to be defeated or when you can defeat a character before they get to resolve their dice. We’re Home and Daring Gambit can turn a game upside down when played at the right time! 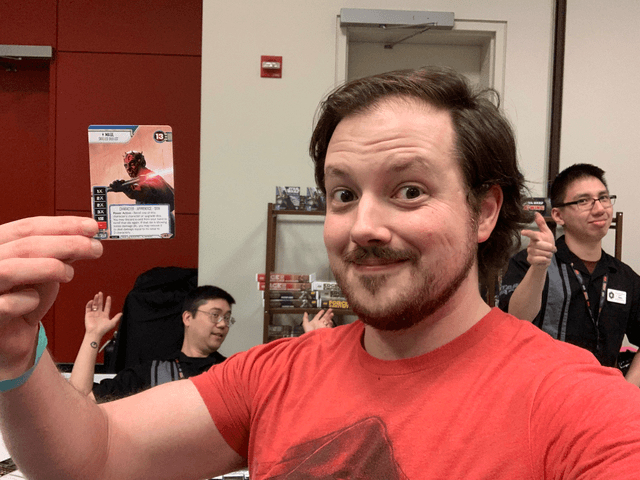 If you didn’t catch our Q&A with Jeremy Zwirn, the lead designer of Star Wars: Destiny, check it out. He talks a bit about the future of iconic character pairings like Han + Chewie! If you’re half as excited about Convergence as I am and want to guarantee you get every card with a Convergence Saga Set (like me), I recommend doing so soon. You can see the shipping estimate in the title above, which currently reads ‘within one week’. We recently ran out of ‘on release’ sets and expect to run out of the ‘within one week’ sets in the next week or two! Love or hate Solo the movie, it is hard to deny how cool the characters are! Val, Qi’ra, and Beckett arrived in Across the Galaxy and last week we previewed another character seemingly inspired by the movie, Chewbacca, The Beast. I was very excited to see one of my favorite characters from the movie, Enfys Nest, announced as a spoiler for the upcoming set, Convergence! When Enfys was first spoiled, a lot of players got caught up on her power action with ‘Scoundrel’ dice. I think her real significance comes by letting you break deck building rules and include two hero and two villain cards. 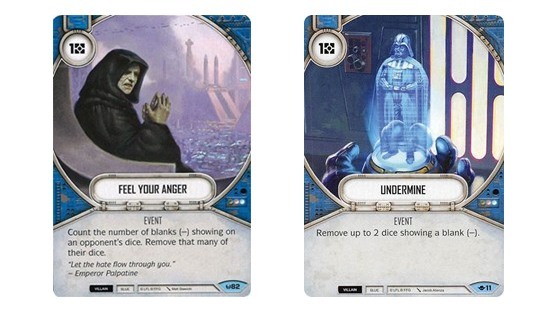 This is obviously great for an all Neutral lineup (which I considered with Anakin and No Allegiance), but I was more interested in bringing a hero card to a villain deck or vice versa. As one of the most powerful cards in the game, I was immediately drawn to being able to play Vader’s Fist out of a hero deck! I will be playing this deck on stream (YouTube, Facebook, and Twitch) Monday, February 18th at 4pm CST! Note this deck is built with rotation in mind, meaning there are no cards from the first three sets. 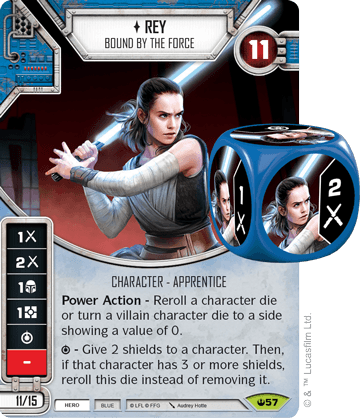 Deck Overview: Given that Yoda can’t generate damage, he has often been paired with characters that can hit pretty hard. This included the original Chewbacca and most recently Zeb in the Trilogy format. This deck is a play on those previous Blue and Yellow hero decks, except this time we also get to include Vader’s Fist thanks to Enfys Nest. This deck has really incredible fundamentals, so it is a great deck for someone that is newer to the game of Destiny. 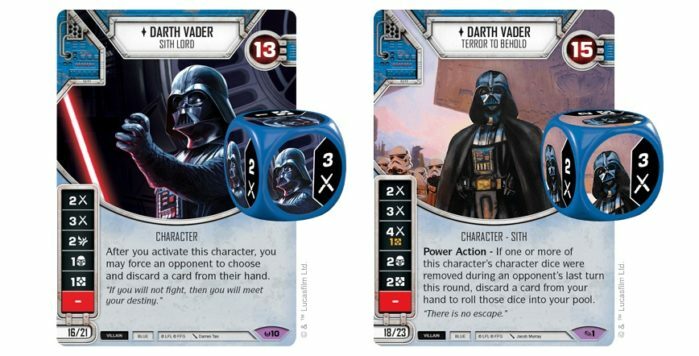 Opening Moves: The dream opening is either being on your battlefield or drawing Well Connected in your opening hand with Vader’s Fist. 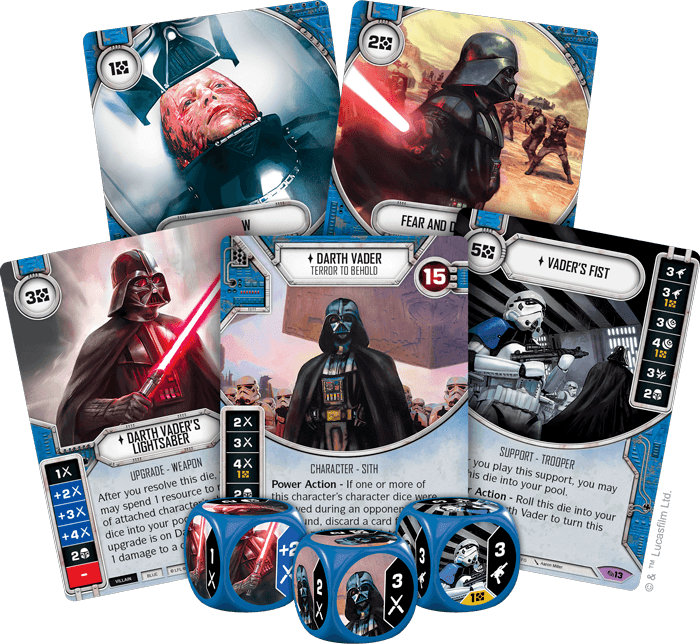 With a single special side on Yoda, you can generate two more resources and get Vader’s Fist on the table on turn one. Short of that, the deck is full of other great options. My favorites include playing a Treasured Lightsaber on Yoda. Next on the list of ideal starts is activating Yoda first to get resources with his Special so you can play a 3-cost upgrade on Enfys and have one resource left over for a control card. 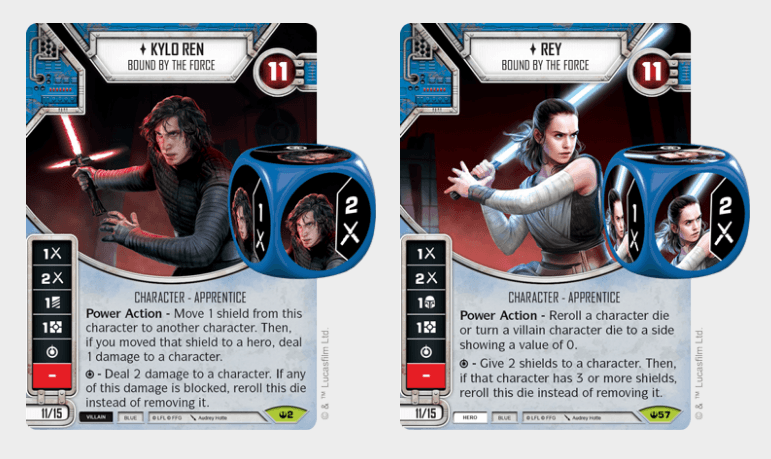 Finishing Moves: The deck includes four control cards (Easy Pickings and Entangle) that require you to spot a yellow character, so you want to upgrade Yoda first to tempt your opponent to attack him. Enfys is a better closer thanks to her damage sides, but Yoda can be difficult to take down in the end game. He also makes your dice super consistent, which is particularly potent with Vader’s Fist. Since the deck plans on your opponent attacking whichever character you upgrade, it includes 5 redeploy upgrades. If you want to guarantee you get Enfys Nest and the rest of the cards in Convergence, I recommend grabbing a Saga Set soon. You can see the shipping estimate in the title above, which currently reads ‘within one week’. We recently ran out of ‘on release’ sets and expect to run out of the ‘within one week’ sets in the next week or two!